In the past 10 years, New York tongues have advanced far beyond dollar bodega swill, to the point where there's a great cup of coffee at practically every subway stop. Pleasing a city of time-crunched food lovers who only want the best is no small achievement, though, which is why we present this list of the city's finest cafes, each worth a little detour just to get that short-lived shot of espresso. From longtime reliables and sneaky Midtown secrets to a coffee spaceship that's accidentally landed in a Downtown subway corridor, here are the best of the city's caffeination outposts. While you may not think of Midtown West when seeking out great coffee, Culture Espresso has been serving up high-brow coffees from major roasters there for years now. The first of the shop's two locations (the other is confusingly located amongst the chains at 36th St and 8th Ave) is always bustling, largely because its a rare neighborhood oasis for the specialty coffees from Portland's Heart Roasters... and also probably because of those lifesaving, fresh-baked chocolate chip and oatmeal cranberry cookies. Perhaps the city's most exciting and unusually located cafe, Voyager Espresso lurks almost invisibly, or as invisibly as a spaceship-themed coffee shop can, in a basement corridor leading to the Fulton Street subway station. 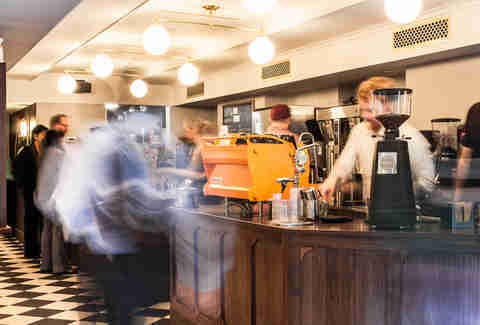 The theme comes to life in the form of silver-painted walls, black marble tables, metal countertops, and bright fluorescent lights (not to mention, lots of metal machinery) -- a far cry from the reclaimed wood and exposed brick interiors typical of NYC's coffee shops. Here, FiDi workers and intergalactic travels taking the J train are greeted by an amiable staff that delivers hard-to-find coffees from a rotating selection of roasters from around the world (and you don't have to worry about any snotty attitude served up as a side item). The kid sister of the Joe Coffee mini-chain, this boutique is less of a cafe and more of a geeky showroom for coffee, coffee tools, the latest stylish coffee journals (which are actually a thing, we promise), and, of course, nerdy talk about coffee while drinking coffee. 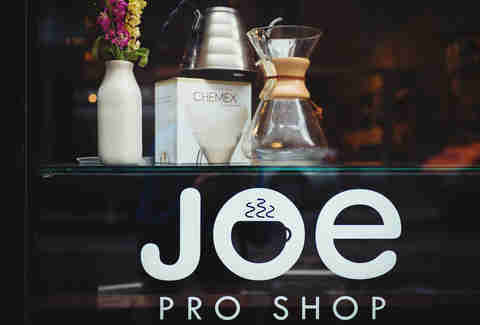 Coffee selections from Philadelphia to Germany rotate each month, alongside Joe's own Red Hook-roasted beans -- and you can pick up a new portafilter basket or gram scale while you're at it. If you don't know what that means, don't be scared off: the coffee's still delicious, and though the menu is limited, you can also score a donut from Underwest Donuts along with your drink. 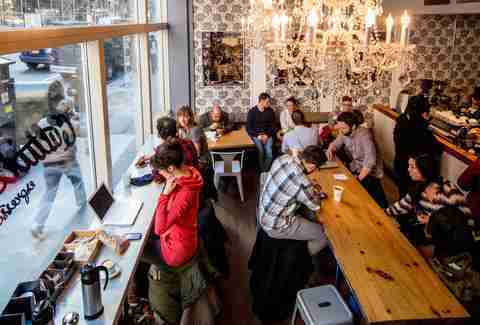 To many, Abraço's shoebox-sized space, where you'll get gruff intimacy with a side of superior coffee, is a quintessentially New York experience, one that makes it still feel like an it-spot even eight years later (the excellent drip coffee doesn't hurt, either). 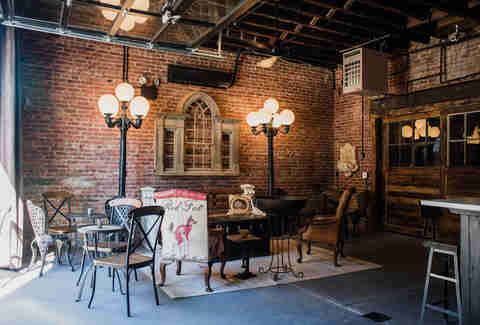 Grab a coffee (they roast their own) and a house-made treat (like the indulgent olive oil shortbread cookie) and savor it at the standing bars on either side of the wide-open window while taking in what's left of the old East Village. A longstanding East Williamsburg scene anchor, Variety Coffee dumped Stumptown and branched out into roasting in 2014, opening this sunny corner spot in Bushwick along with the move. 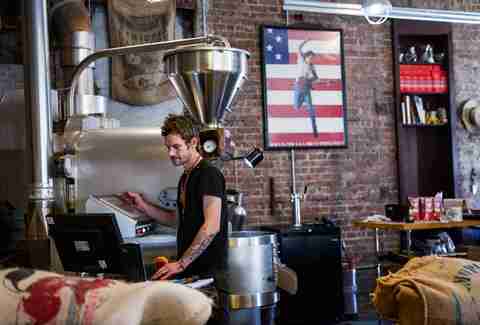 The coffees have become as popular as the shops, propelling Bushwick-browned beans to the national stage. Humble Ramapo Valley roaster Plowshares snuck a stealth retail space into Bloomingdale in 2014, bringing with it a fine stock of organic and fair-trade coffee beans roasted in small batches and a swanky, diminutive hangout spot with spare seats and industrial lighting. Two years later, it continues to make a strong case that Columbia students and uptown residents are some of the luckiest caffeinated New Yorkers. 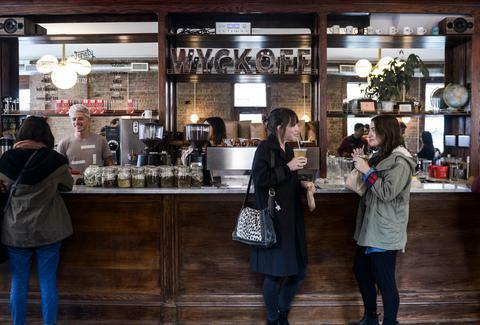 An unlikely marriage of steampunk chic and supernerd, Sweetleaf's four NYC cafes constantly supply some of the most detail-oriented preparation and delicious coffee in Brooklyn and Queens. The Greenpoint outlet serves as both a roastery and cafe, while the open-air space means you can roll up your bike and pretend you're actually living in a West Coast city for a few brief minutes. 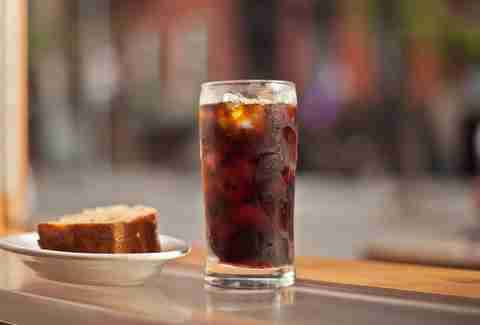 Order a house-made baked treat and a signature iced coffee drink like the Rocket Fuel with maple syrup and chicory. Grand Central's already abundant local coffee offerings -- Irving Farm, Joe, and Oren's -- reached the tipping point when Brooklyn-based Grumpy moved in, taking over the Lexington locale where a Starbucks once stood, marking a critical moment in the city’s embrace of local, quality coffee. 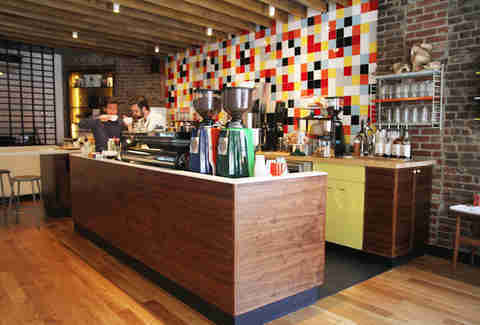 This handsome Deco space is one of Grumpy’s prettiest, and features two gleaming multi-head Synesso espresso machines, just in case things get busy -- which they certainly do. If you're trapped on the corner of West Broadway and Canal, and contemplating Dunkin' Donuts, reconsider for a moment: what if champion baristas and hosts of encyclopedic depth were a stone's throw away, waiting to prepare you a practical coffee beverage of marvelous quality? That’s what you get at Everyman. The shop -- Everyman’s second and far more stylish location -- serves Counter Culture Coffee in both traditional and delicious, cocktail-inspired signature beverages. Also: artisan soda fountain. If someone told you that you could have one of the most pleasant coffee experiences in the city at 56th and Lexington, would you believe them? Until Little Collins threw open its doors in 2013, the answer was probably no. The Australia-meets-Midtown aesthetic is a full-on success here, with a range of healthy(ish) salads and sandwiches (everything from veggies to brisket) and top-class coffees from Counter Culture, all served by probably the most professional and polite staff in all of New York. Liz Clayton is a coffee writer and photographer living in Brooklyn, NY. She's the associate editor of the coffee website Sprudge.com and a regular contributor to coffee and culture publications worldwide. She is currently working on a coffee guidebook for Phaidon Press, due out spring 2017.